Diane Sweeney has been a national consultant since 1999. After teaching and coaching in the Denver Public Schools, Diane served as a program officer at the Public Education and Business Coalition (PEBC) in Denver. Since then she has become a respected voice in the field of coaching and professional development. The author of Leading Student-Centered Coaching (Corwin, 2018), Student-Centered Coaching: The Moves (Corwin, 2016), Student-Centered Coaching at the Secondary Level (Corwin Press, 2013), and Student-Centered Coaching: A Guide for K-8 Coaches and Principals (Corwin Press, 2011), Diane holds a longstanding interest in how adult learning translates to learning in the classroom. Diane holds a Bachelor’s Degree from the University of Denver and a Master’s in Bilingual and Multicultural Education from the University of Colorado, Boulder. Leanna Harris has worked in the field of education in a variety of capacities for over 25 years. She worked for several years as an elementary classroom teacher in both independent and public schools in the Denver area. She then brought this experience to the larger educational setting as a consultant and staff developer with the Public Education & Business Coalition (PEBC), and later as a school-based instructional coach across grades K-12. She has worked with teachers and schools from around the country to improve instruction and student achievement. 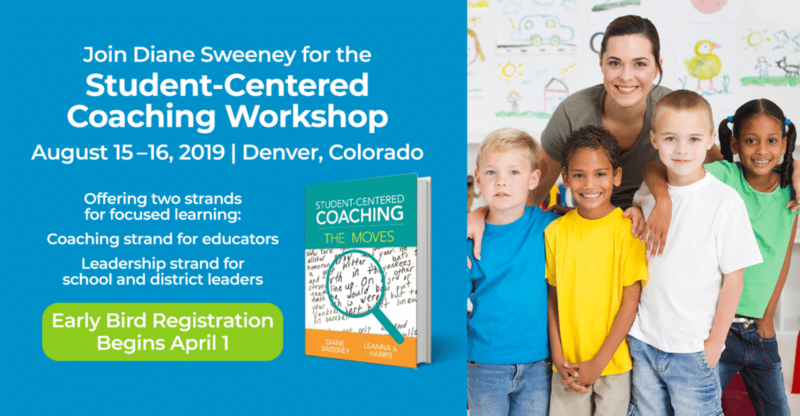 Leanna is the co-author of Student-Centered Coaching: The Moves (Corwin, 2016). Leanna has a MA in Education from the University of Colorado at Denver and an undergraduate degree in Theology from Georgetown University. She also has a Certificate in Sustainability Leadership and Implementation from the Daniels College of Business at the University of Denver – environmental sustainability being her passion when not thinking and learning about kids, teachers, and schools. Julie Wright is a teacher, instructional coach, and consultant with over 25 years of experience in education. She taught at the elementary level for 14 years in Upper Arlington, OH and led district-wide professional development for literacy and social studies teachers for six years. She served as an adjunct faculty member at Ashland University, teaching graduate courses focused on curriculum, instruction, and assessment. Julie worked as an instructional coach, in both urban and suburban settings, in New York for the past four years. She is a contributor to Choice Literacy and Lead Literacy, and has written for Heinemann’s Digital Campus titled Love Letters. Julie is working on a book focused on five moves that lift small group reading instruction which will be released through Corwin in the spring of 2018. She holds National Board Certification as well as a B.S. in education, a master’s in language arts and reading, and extensive school leadership post-graduate work (including a pre-K through grade 9 principal license) from The Ohio State University. Karen Taylor has been in education for 30 plus years, the majority spent as a classroom teacher or instructional coach for school districts in Texas and Arkansas. Karen served 6 years as a professional developer for the Arkansas Department of Education in a state lead role as a developer of professional learning for instructional coaches. While there, she trained and supported state specialists who deliver instructional coaching training. During her tenure, Karen also traveled as a consultant sharing her expertise in the area of 6+1 Traits of Writing and coaching within school districts and regional education cooperatives. She served an additional four years as a regional literacy and dyslexia specialist for Dawson Education Cooperative supporting schools in building capacity to improve instruction and student achievement. Karen cherishes opportunities to learn and work alongside educators on the journey to create lifelong learners. Karen holds undergraduate degrees in Elementary and Learning Disabilities Education as well as a MA in Mildly Handicapped Education from the University of Central Arkansas in Conway. She later accomplished post-graduate work for certification as a reading specialist from the University of Arkansas in Little Rock. Ann Mausbach has spent the last 30 years as an educator. Ann’s belief that the greatest investment a leader can make is in people not programs has focused her work on supporting principals and teacher leaders with the tools they need to align purpose with action. She is the author of School Leadership through the Seasons: A Guide to Staying Focused and Getting Results All Year (Routledge Eye on Education, 2016) and Align the Design: A Blueprint for School Improvement (ASCD, 2008). Ann’s administrative experience includes serving as a Coordinator of Staff Development, Director of Curriculum, Director of Elementary Education and an Assistant Superintendent for Curriculum and Instruction. She holds a PhD from the University of Kansas. She currently works as an Assistant Professor for Educational Leadership at Creighton University in Omaha, NE. Brooke O’Drobinak has been in education for over 25 years. Most recently, she has served in school administration, as the Director of Curriculum and Instruction and Assistant Principal in Denver, Colorado. Prior to that, she has been a classroom teacher, district staff developer, university educator, senior state department consultant, and school design consultant. Her work continues to focus on issues pertinent to creating successful schools, including strong school culture, instructional coaching, student literacy, cultural relevance, effective assessment instructional, and curricular practices and professional learning. Her work is founded on the belief that students and relationships are at the heart of school communities, and that student safety, ownership and care are of utmost concern. Furthermore, creating the conditions under which adults in school communities can focus on students – both as scholars and people – is essential to the task of school leadership. She earned her BA in Economics and English and a Post-Baccalaureate Degree in Secondary Education from the University of Arizona, Post-Secondary Degree in Spanish Language and Culture from the Universidad de Sevilla and her MA in Curriculum Leadership from the University of Denver. Dan Sweeney joins the team at Diane Sweeney Consulting as Project Manager. With a background in client relations, operations, and finance, Dan provides both our clients and staff the direct support they need to ensure that their projects are well managed. Dan is a graduate of Colorado State University. Please contact Dan directly if you are interested in working with a consultant from the Diane Sweeney Consulting team.